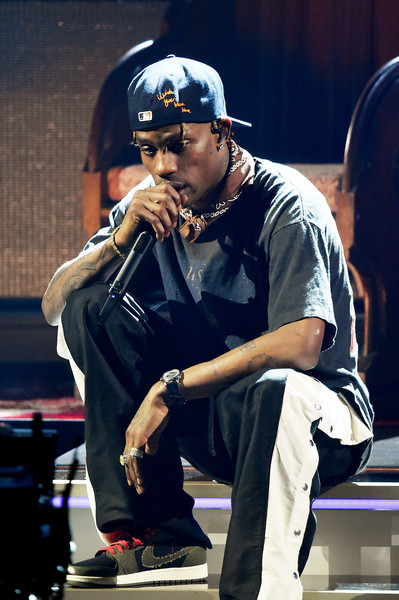 Fresh from the 2019 Grammys (where he was nominated for three awards), Travis Scott had to pospone his sold-out show in Tulsa, Oklahoma last night. And let's just say his fans were MORE than pissed. We're sure they were upset they weren't going to be able be able to see ASTROWORLD come to life, but the fact that it happened so last minute probably sent folks over the edge. Once they found out the show was postponed (promoters put "Postponed" signs on the doors), chaos ensued and it resembled his Grammy performance. In case you missed, watch the Houston native "tear the 'stage' up" HERE. Fans got totally out of control. They cracked the glass on the doors of the BOK Center after throwing guard rails at it. They also tried to rush inside, but police were able to slam the doors back shut to keep them out. The mob of fans stood outside the venue chanting, "Let us in!" The "Sicko Mode" rapper hopped on Twitter to apologize and told his Tulsa fans the show would be postponed until March 26th. The canceled show at the BOK center last night in Tulsa was chaos. Our lovely Police Dept fired pepper balls into the crowd to get people to evacuate. Travis canceled 30 min before show time and folks were confused abt what was happening. Front door of BOK center SMASHED! WOW! This isn't the first time he has had to postpone shows due to production issues for his elaborate set, which includes a roller coaster. The "Stargazing" rapper and his girlfriend Kylie Jenner threw their baby girl Stormi Webster her 1st birhtday bash, and of course, it was extravagant AF. The theme of the party was inspired by her dad's ASTROWORLD. They hosted "Stormi's World," which featured life-sized teddy bears, a blow-up face that resembled the birthday girl and amusement park rides. Must be nice.